We are taught to believe that vulnerability is weakness. We think that being vulnerable makes us look foolish. We fear that if we get vulnerable with another person, we may get hurt and never recover. In this post I’m going to invite you to see vulnerability in a much different way. But first, let’s talk about why and how we avoid being vulnerable. Vulnerability is our willingness to expose our truth. This can be really hard, because the truth can be scary and shameful. Therefore, we do everything we can not to be vulnerable. We try to avoid vulnerability in many ways. But the biggest way we do it is through judgment. In many cases judgment has been our greatest defense mechanism. We have used it to defend against our vulnerability. We fear that if we let our guard down and act compassionately and lovingly toward one another that we’ll be taken advantage of and no longer be safe. This is totally understandable given the traumas we’ve experienced in the past and all the new traumatic events in the world. We’ve built up a wall against the presence of love and instead grown to rely on judgment as our protector. Our judgment of others has protected us from facing our wounds. But it’s also held us back from healing and growing. Our unwillingness to face the discomfort with self-compassion keeps us from experiencing miracles. Behind the wall of judgment lie our deepest feelings of inadequacy and shame. When we feel separate from others our shame is triggered. We feel alone, not good enough and unworthy of love and connection. Shame is the most difficult emotion to accept and we’ll do anything to avoid feeling it. We resist it by projecting it onto others through judgment, and then we grow to rely on judgment as a way of finding relief from our wounds. 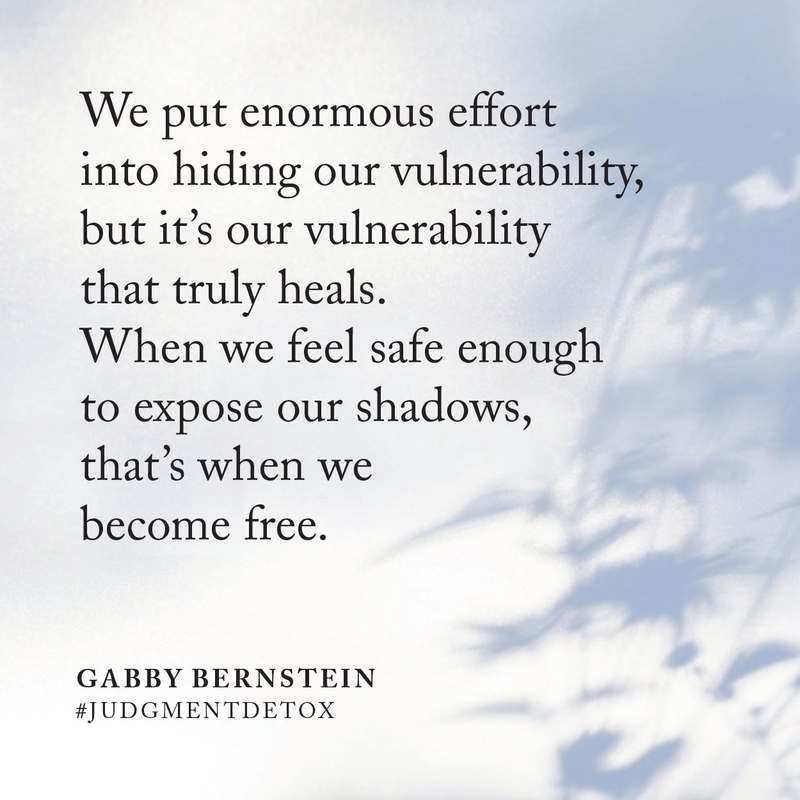 But when we suppress our shame and refuse to be vulnerable, we feel disconnected from others and out of alignment with our truth. Refusing to be vulnerable can make us feel incredibly lonely, even when we’re surrounded by family and friends. When we don’t allow ourselves to be vulnerable, we can feel like we’re putting on an act for the world. We think being vulnerable is weak. But nothing could be further from the truth. Being vulnerable isn’t weak. It takes guts! We put enormous effort into hiding our vulnerability, but it’s our vulnerability that truly heals. When we feel safe enough to expose our shadows, that’s when we become free. We don’t have to protect our shadows any longer. We can begin to dismantle the wall that separates us from real, authentic, fearless love. Vulnerability is a gift we give others because it allows them to see us for who we really are. It lets us be authentic and truthful, which in turn allows us to create genuine connections and deepen our relationships. All relationships benefit from our willingness to be vulnerable. When we expose our truth, we give others permission to do the same. In moments of authentic expression we release all the pretenses we’ve built up and let people in on who we really are. Being vulnerable allows us to show up more fully in the world. Your authentic truth is your magnificence. Your willingness to let the world see you in truth is your greatest contribution. When we all get real, the world will heal! In the video clip above, Oprah says that vulnerability is the cornerstone of confidence. This couldn’t be more true. When we are vulnerable we are real. You’ll see how strong you really are and you’ll stand tall in your authentic truth. Vulnerability is incredibly powerful. It creates genuine connection. There is nothing sexier than your authentic truth. When you let your guard down and become willing to be vulnerable, you invite others to do the same. You strengthen your relationships. You let others know it’s safe to be honest with you. You become a messenger for the light! The moment we are vulnerable is the moment we feel free. Being vulnerable allows us to let go of whatever false persona we’ve been projecting. Instead, we can step into our truth. So how do you go about actually being vulnerable? First, it’s important to remember that vulnerability is a practice. The more you allow yourself to be vulnerable, the easier it becomes. Vulnerability feels good because you’re honoring your emotions and expressing them honestly. The more you practice it, the better you’ll feel! Being vulnerable may be uncomfortable at first. That’s okay. There’s a great passage in A Course in Miracles that says that we have to be grateful for our most uncomfortable circumstances, because those are the circumstances that show us what we need to heal. Remember that. Because this is what we are here for. We’re not here to walk around being perfect, enlightened beings. We’re here on a journey of unlearning fear and remembering love. One day at a time we show up with the intention to surrender and then surrender some more. The most powerful way you can start embracing your vulnerability is by healing your judgment. The first step in healing our shame and letting down our guard is to accept that we are not the victim of the world we see. This is why the Judgment Detox process begins with witnessing your judgment (Step 1) and honoring your wounds (Step 2). These two steps bring you clarity and deep, deep relief. Another big part of practicing vulnerability is to allow others to be vulnerable around you, too. When others express vulnerability to us, it is our job to be kind and compassionate. It takes a lot of bravery to expose your shame and be honest about your feelings. Therefore, we must hold others in their vulnerability and thank them for being real. The temporary discomfort we might feel is far outweighed by the stronger, deeper and more authentic relationships we’ll build. My dear friend Lewis Howes has amazing insight into vulnerability, especially when it comes to men. If you’re a man who struggles with being vulnerable, Lewis’s advice in his book The Mask of Masculinity is indispensable. It’s incredibly valuable for women, too. Lewis will help you hold space for your partner so he can feel safe being vulnerable with you. If you are having a tough time letting go of your judgment of another person, say this prayer. Check out my free Judgment Detox Mini Course! In this FREE 3-part mini course, I guide you through 3 core practices of the Judgment Detox. Release judgment and feel good fast! Get instant access here. One of the situations where it’s hardest to be vulnerable is at work. We often think that vulnerability is unprofessional, especially in a more formal workplace. But in fact, being authentic and vulnerable makes us happier and more productive at work. And it makes for much stronger teams! 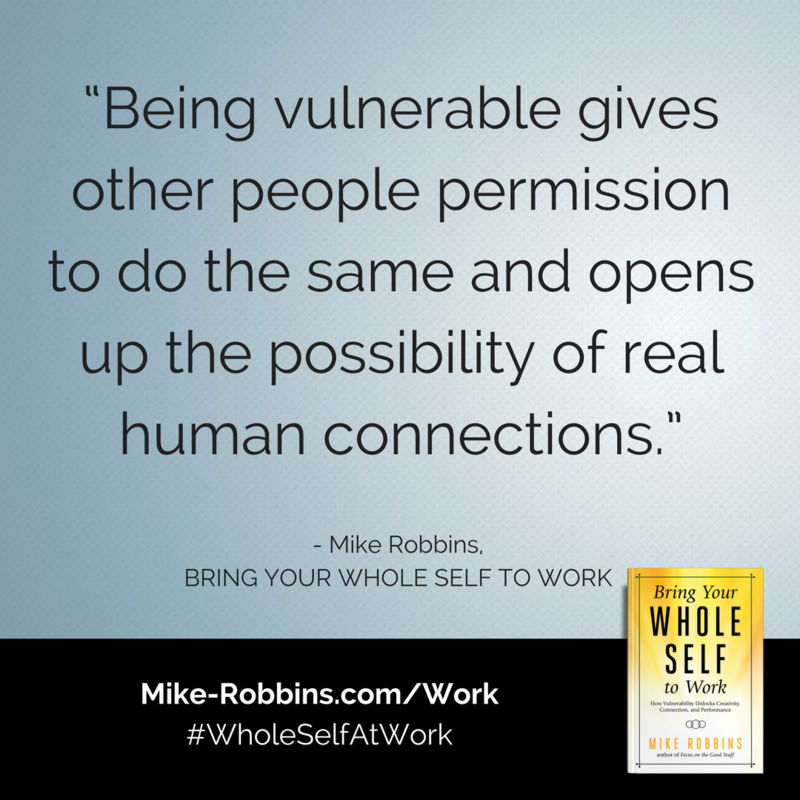 I’m really excited to share that my good friend Mike Robbins takes on this topic in his new book, Bring Your Whole Self to Work. I highly recommend reading his blog post about what it means to bring your whole self to work. Being vulnerable takes courage. Unfortunately, all too often we relate to vulnerability — especially in certain environments, relationships, and situations (particularly at work) — as something we should avoid. But it’s vulnerability that liberates us from our erroneous and insatiable obsession with trying to do everything “right” — thinking that we can’t make mistakes, have flaws, or be human. Embracing vulnerability allows us to let go of the pressure-filled perfection demands we place on ourselves. In addition to liberating us, being vulnerable gives other people permission to be vulnerable as well; and in doing so, we open up the possibility of real human connection. The natural human response to vulnerability is empathy. And with empathy, we can create deeper trust, connection, and understanding with those around us. Start your Judgment Detox practice with my free mini course! I made a free Judgment Detox Mini Course to guide you through 3 core practices of the book! When you take this course you’ll experience the promise of healing judgment right away. Access the free mini course now! Thank you so much for this reminder. I have been in sobriety since about when Brene started becoming famous as the Shame and Vulnerability Nut. I am now breaking out of my comfort zone and writing online about how to be happy and sober, (or sober and happy). I’ll certainly read Lewis’ book, because there are so few men in the Vulnerability Arena. I hope with the work you are doing and Brene and Lewis and the like, we can help the world heal from Judgementism. Great work Mike! Happy to hear about your writing! Continue to choose love over fear. Beautiful Kairavi! I had an Achilles' tendon rupture some weeks ago and the usually very active me is stuck with crutches, a cast and an indefinite recovery time. This might not sound so bad and in some ways it isn't because it gives me time to rejuvenate and ground myself and, what's equally important, I have to ask for help all the time, including help with opening the door to my apartment building. And for someone who is used to doing everything by herself this is a great practise at being vulnerable. Also not judging myself or the changes my body is undergoing while I'm less active or struggling. Thanks Gabby, I am watching your Judgement Detox videos/ course and have the book. It is not an instant fix for me. But each time issues, thoughts emerge I am so much more aware of how I need to work through them. For me I think it will be a long process. Very helpful for me. Thanks again. Wonderful Ken! It’s definitely a practice. Love that it’s serving you! I just got back from part one of two job interviews and strangely enough my thoughts during the interview are similar to yours. I mentioned love, spirituality and mindfulness as part of my work ethic and it was well-received; I felt quite brave! Thanks Gabby for your very insightful thinking! Very timely discussion. I have always believed vulnerability is a strength. I do not always practice it. I am currently going through a circumstance which calls me to vulnerability and I must say it is a little scary. I recognized the need to let it be what it is and made the phone call I needed to make to start that healing process. Then I came to my computer to do some office work and I started by reading my emails, which brought me to this discussion. It has reaffirmed my action jto vulnerability and has strengthened my resolve to walk through it in love, not judgement. Thank you. “When we feel safe enough to expose our shadows, that’s when we become free. 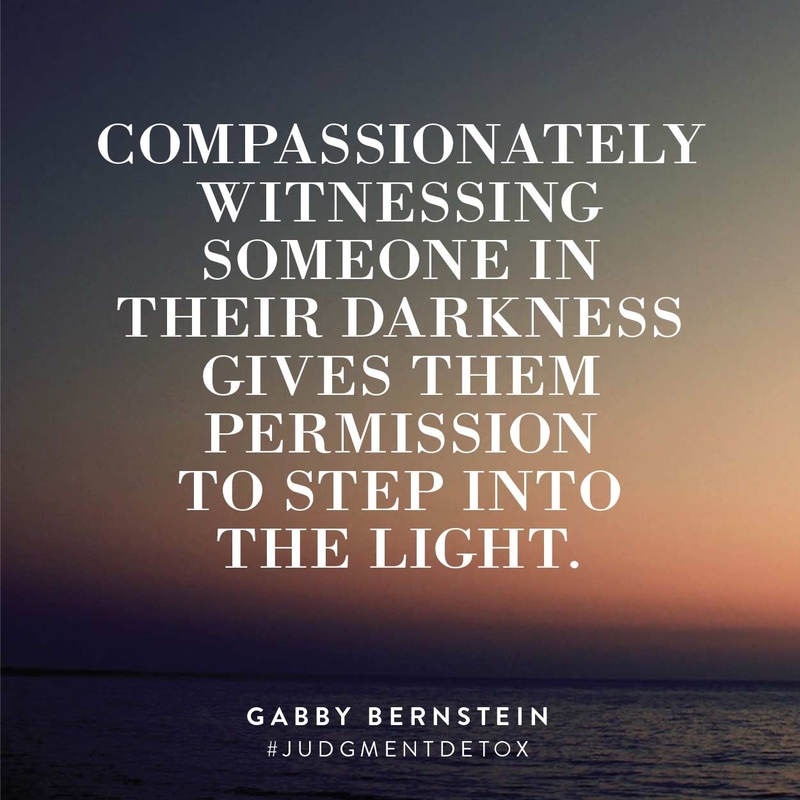 We don’t have to protect our shadows any longer.” so my issue is; when you are knowingly (b/c they tell you) a comfortable space that others…can make themselves vulnerable;they are safe; they feel there is listening and response with compassion…what do you do when they don’t do the same for you???? you don’t feel safe; you feel judged and just get responses that are clearly not at all supportive whether they agree or disagree in a constructive, learning/growth way? This was soooo helpful!!! Thank you Gabby!!!! Thank you for this! There is so much content in this email from your vid to Brene Browns Ted talk and super soul sunday. Wow! I really needed this! I had a discussion with my manager and and started crying. I was feeling quite embarrassed but after reading your email…Im feeling fine! Going to order your book now. Oh wow, this post is spot on and perfectly timed! I’ve been learning about vulnerability and shame through Brené Brown and her books and oh, it’s been a journey, definitely not an easy one, but so worth it. I really liked the SuperSoul Sunday video you added, cause as it’s said there as well – you cannot get to courage without vulnerability. And the very fact that you are willing to be vulnerable, facing the music, even though it can leave you, in some situations, heartbroken, sad, devastated even, and if you’re willing to do it over and over again, facing the uncertainty of how the other party can react, who is not maybe that prone to vulnerability… if this isn’t courage, I do not know what is 🙂 And what you shared from A Course of Miracles, that our most uncomfortable circumstances are showing us what we need to heal – that’s my current journey right now. What a beautiful journey to be on. I know it isn’t easy. It requires your commitment and faith. But you will experience miracles. Thank you for sharing your story. I am struggling with a decision on whether or not to be vulnerable in an internship work environment I recently started in. I am an empath and the man who is leading my internship seems to be unreasonable and irrational and I am starting to think narcissistic. I have been learning from Christiane Northrup and Judith Orloff about these types and I am trying to decide if engaging at all by being vulnerable will be helpful or if will open the gates to even more attacking and bullying remarks. Feeling stuck, sad and frustrated. And a bit victim-y… Thanks! I just want to express my gratitude for inspiring me to follow through on my dreams and you have introduced me to A course in miracles, which has profoundly changed my life. I have started writing, as you recommended, and allow myself to be a channel for the divine message. It feels so natural to align with my higher self. I am so so happy you found your way to ACIM. Enjoy the practice and the miracles. I love vulnerability. I think it’s difficult to show which is a reminder that it takes strength to do so. Vulnerability has provided an added bonus in my life in that it has helped me to grow closer to my friends who support and nourish me while showing me which friends take my vulnerability and use that moment to walk all over me. Now, instead of wallowing in the pain of those unsupportive friends’ choices, I can recognize those moments for the blessings that they are and let those friends go while wishing them well. Instead of feeling like I’m being dunked under water in my toughest times, I am buoyed more than ever before. Thank you, Vulnerability. Was watching a movie today called The Frame starring Tiffany Mualem. It was a mesmerising film, imho, searched Tiffany who was terrific in the film and found you through her Twitter feed. Ordered a hard copy of Judgement Detox after reading first 25 pages on Scribd. It resonated with me. Judgement pervades throughout my life, from/to others to myself primarily. So I feel my convoluted path to your book, like much in this life, will prove to be no coincidence. No matter how many twists and turns the path had, it led you here. I am so glad you found Judgment Detox and I hope it serves you. Thank you for sharing this. My husband is a very private person, but a lot of my story that I would love to share is around our marriage and my relationship with his daughter. How do you reconcile respecting the privacy of those close to you who are NOT big sharers with the nudge to speak your truth? Private Facebook communities are the only outlet I’ve found so far! My miracle is taking the time to read your book the Unierse has your back and this website. Chris, taking time for yourself is a beautiful act of self care. Sending lots of love and healing. Hi Gabby, this has completely changed my life. I had no idea that the reason I was so stuck with my childhood sexual abuse regardless of all the work I had been putting in was myself judgement which resulted in major shame. I am so grateful for your work, it has completely liberated me and allowed me to be vulnerable with the people that have been waiting to see me get this open with them. I feel like I have been woken up from a deep sleep. So thankful. Hey Gabby, the article is really very nice. The points are very clear and relatable. The tips are very useful for me personally. Thank you for sharing such a wonderful article. Excited that this supported you! Couldn’t ask for better timing to read this blog as I got hurt in a relationship that was abusive toxic to me so I left the guy and let go of judgement seeing peace instead of hate. Thanks Gabby! Bless you.